Sony’s AR-series multimedia range has been around for over a year now, making it one of the oldest designs among its rivals. 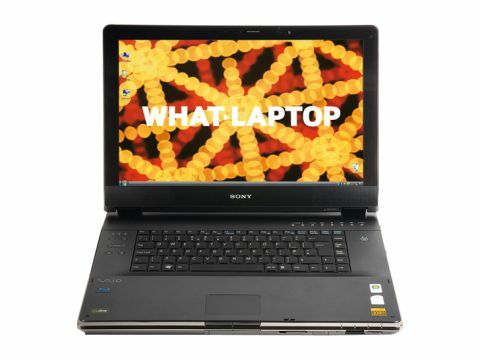 Even among other high-end machines, the 17-inch screen stands out, offering excellent colour reproduction. This is partly due to Sony’s X-black technology – a glossy Super-TFT coating that helps to add vibrancy to colours. As with other Super-TFT screens, it also makes reflections and fingerprints more visible, but we never found it a problem unless sitting in direct sunlight. The screen features a resolution of 1920 x 1200 pixels (WUXGA), and the resulting images are clear and smooth. We found it ideal for playing games or watching movies on – and the built-in Blu-ray drive will let you watch films in high definition. Icons and menus do appear small in everyday use, however, so you may want to adjust the settings. Games ran without problems thanks to the mid-range nVidia GeForce 8600M GT graphics adapter. Performance was better in this machine than some others without this addition, with games running more smoothly. The large chassis offers plenty of space for the user interface, but Sony has elected not to fit a dedicated numeric keypad. As such, the standard board looks slightly too small, with lots of blank plastic on either side. It is a responsive and comfortable keyboard, however. Our biggest complaint about this machine is the location of its touchpad buttons. You’ll find them situated on the very front of the chassis, making them awkward to use when on a desk, and near impossible with the machine resting on your knees. We also found the chassis heated up considerably over longer periods of use, due to the powerful GPU and twin hard drives. The AR51SU proved an impressive machine when it came to everyday use, helped by its high-end Intel Core 2 Duo processor and 2048MB of memory. We found Windows booted quickly, and even running several applications at the same time didn’t cause the system to slow down. The two 250GB hard drives are great for storing recorded TV programmes or movies, and you’ll also be able to set one as a back-up drive. The AR51SU is a good machine with an excellent specification and screen. It’s just a shame the chassis heated up under intense use, and the mouse buttons are impossible to use comfortably.